Welcome to the room that we never talk about. My daughter is very sensitive about changes to her personal space. I always had so much “vision” when it came to my kids’ rooms, but my daughter is a very creative soul. Sometimes I would attempt to tackle her room again, but it would almost always result in a heap of tears if she would see old clothes or toys get donated. Do you have a sensitive child like this one? I actually had to give up on that room for awhile, but by doing so, you could imagine how hard it was to keep up with it. Anyway, I have to admit — I love decorating kids rooms. 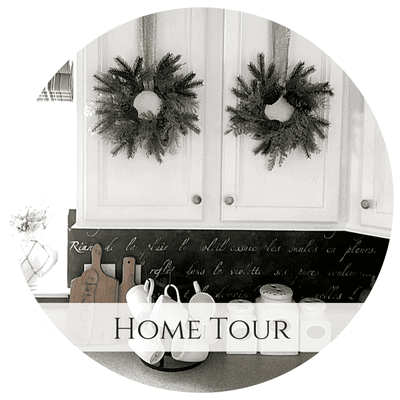 It’s one of the areas of the house where freeform decorating is allowed, and trends don’t dictate our lives. So when my 11 year old said that she’s ready to update her room, I admit to a slight panic because so much “stuff” had accumulated in there. 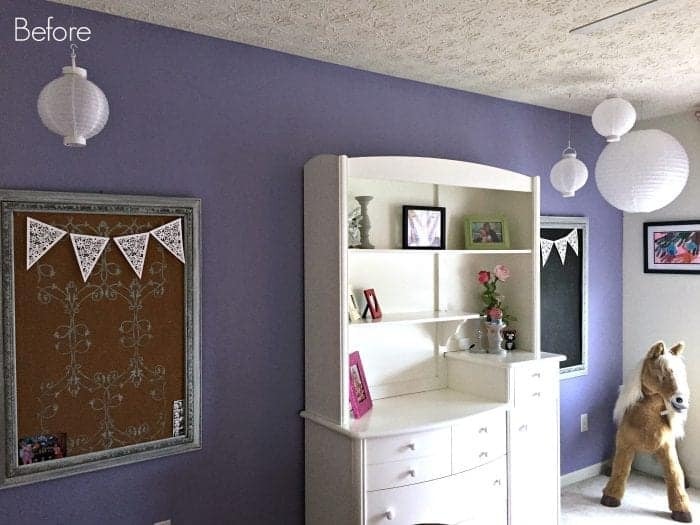 And I actually liked her purple room and was sad that I never finished it. Here is the “before” — we still had a few obstacles to overcome to make room for some changes. 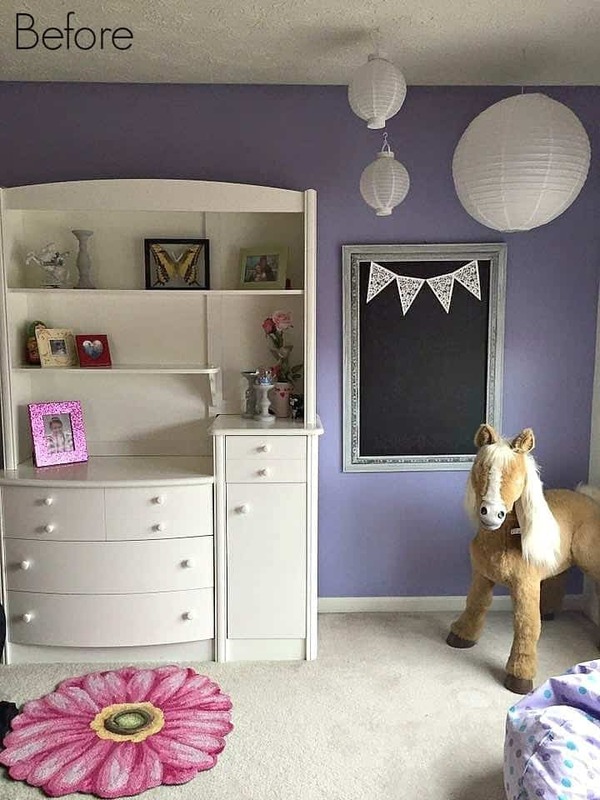 First, we sold the baby changing hutch (pictured) and she decided she wanted to say goodbye to Butterscotch the horse. She’s going to use the money for new items in her room. She’s eyeing up a futon that just might complement the “tween” years perfectly for her sleepovers. 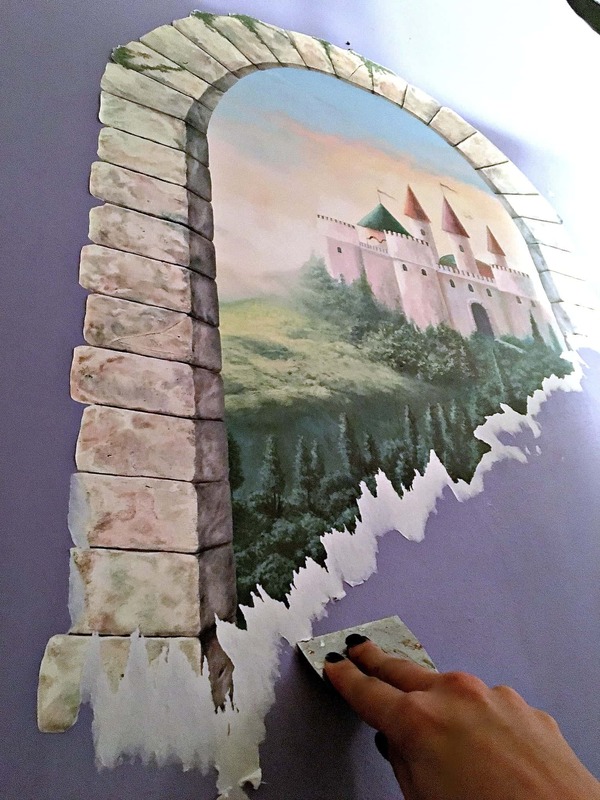 …behind each frame were two Trompe L’Oeil windows overlooking a castle that I put up in 2006…yes, she had outgrown her princess theme years earlier. I didn’t realize that phase would be so short lived! One night, I invited her to pin a few ideas on Pinterest. As you can see, she doesn’t quite “get” Pinterest, but — with what little bit she pinned, I could see that a theme was starting to develop. 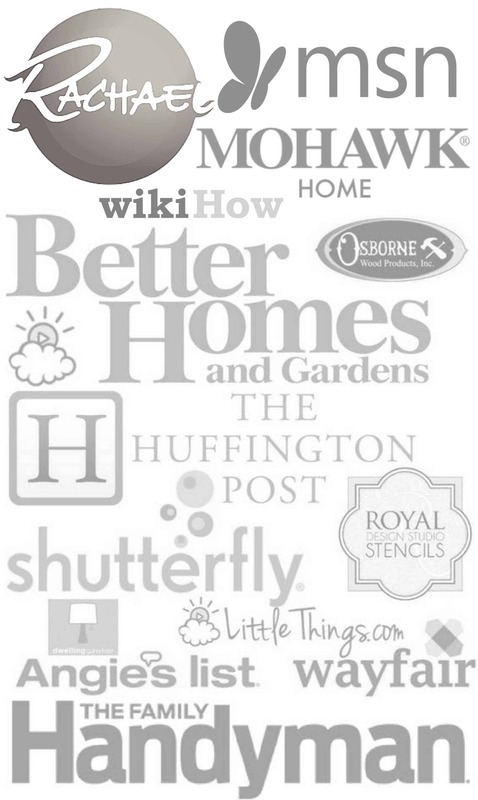 Follow Jeanette @ SnazzyLittleThings.com’s board // tween pins on Pinterest. So, it’s looking like chalkboard walls are “in” at my house. The chalkboard trend might be fading, but in my opinion, kids’ rooms are exempt from these rules. I really wanted to give her a space that she’d love for the next few years, and I certainly don’t want my daughter to learn that trends dictate her style. She loves doing nail art, and having big groups of friends and sleepovers. I can imagine this wall filled with graffiti for years to come. 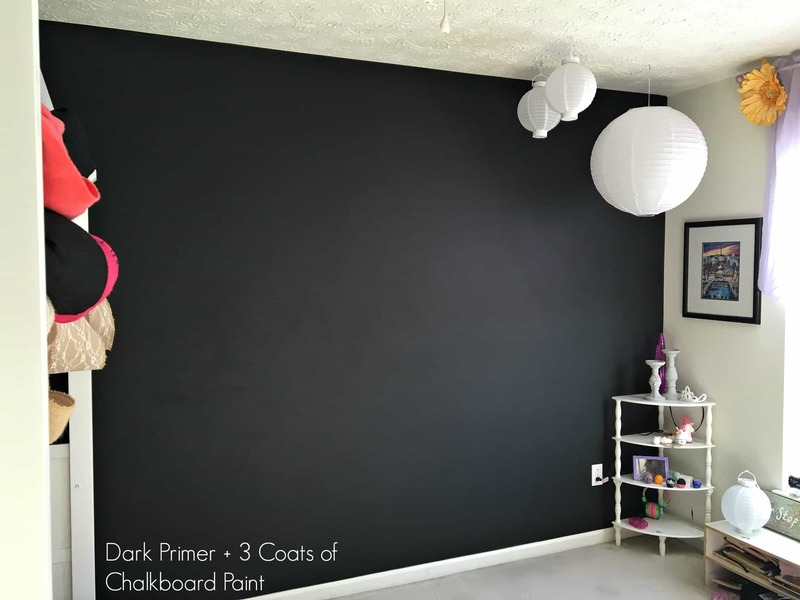 With regular matte black wall paint (not chalkboard paint) I cut in at the ceiling and above the baseboards with 2″ nylon, angled paint brush. This served as a dark primer and ensured better coverage. I covered the entire wall using regular black. Once dry, I sanded with a fine grit sandpaper then wiped down with a dry cloth. Using a foam roller to ensure a smooth finish, I applied the black chalkboard paint in a “W” pattern all over the wall, applying paint this way makes it appear less streaky when dry. I feathered the chalkboard paint out towards the edges. The coverage was perfect and I didn’t need to waste expensive chalkboard paint to serve as my base primer. Between coats, I sanded with a fine grit sandpaper. 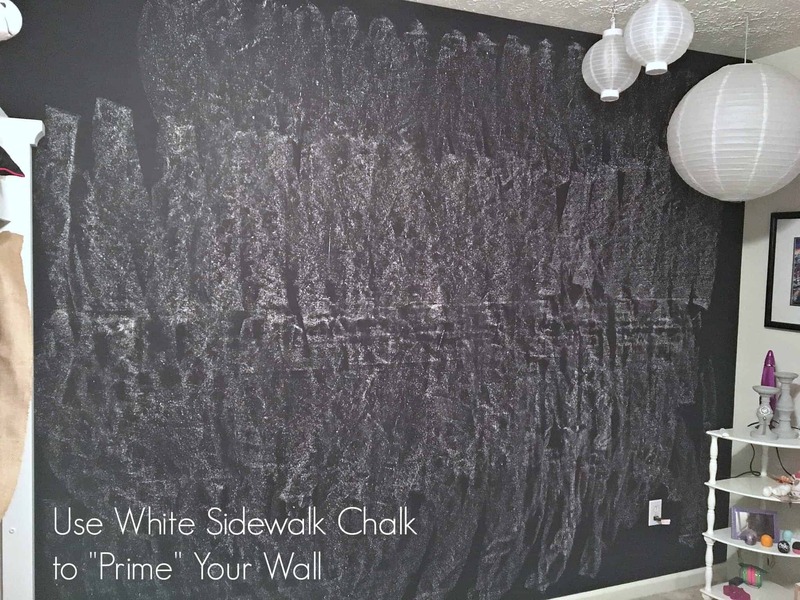 I applied three coats if chalkboard paint overall…and for the wall you see here, I only used a quart-and-a-half! I was surprised. Think using the base coat helped with coverage. Here is the paint that I used, and it went a long way. I’ve read numerous posts about “seasoning” the wall with chalk. So I did this by placing a piece of white sidewalk chalk on its side. Never in a million years did I think I would be using sidewalk chalk inside the house…but it worked perfectly. Then, I erased the chalk in a circular motion using athletic socks (clean ones, of course!). Be sure to sweep afterward because it was definitely messy. Cute artwork aside, if this messier look drives you crazy, then a chalkboard wall probably isn’t for you. This is the “normal state” after only a few uses. Eventually, I might provide you with a perfectly staged picture with a cleaner wall and beautiful calligraphy, but I wanted to give you the “real” version. To restore it to the darker hue, use a damp cloth then re-season with the sidewalk chalk. 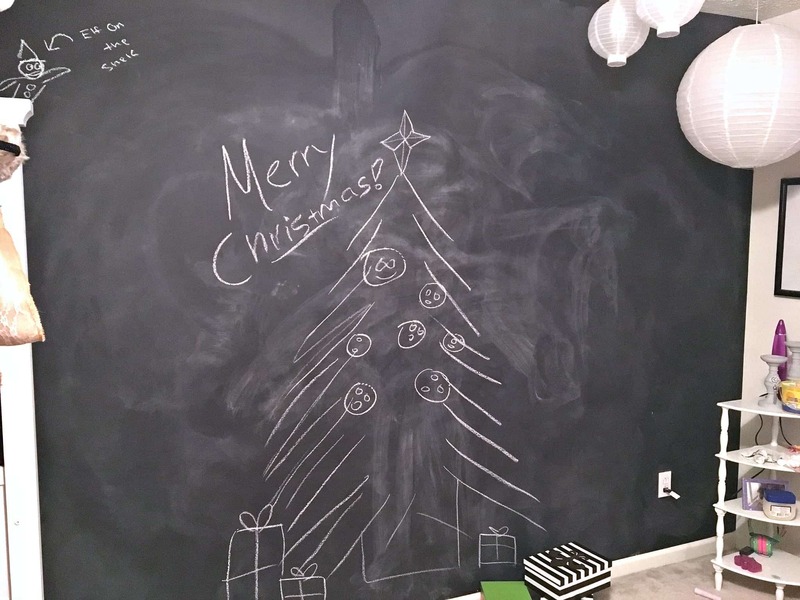 I can see how reapplying the chalkboard paint every year might spruce it up also. 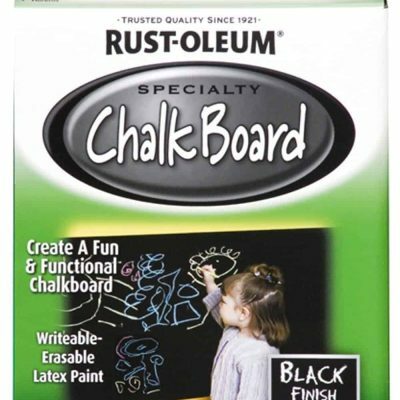 I love chalkboard accents, but think this has offically satisifed my curiosity about having one in our house. But I have to admit, my daughter and I have had a blast drawing on it ever since it’s been finished. She loves it, and I even got her permission to “keep decorating”. Mission accomplished! For kids’ spaces – I don’t agree. Do what you love! I personally don’t mind chalkboard accents in my home when they serve a useful purpose. It’s messy. You will need to vacuum often. Chalk pens did NOT erase easily for me. 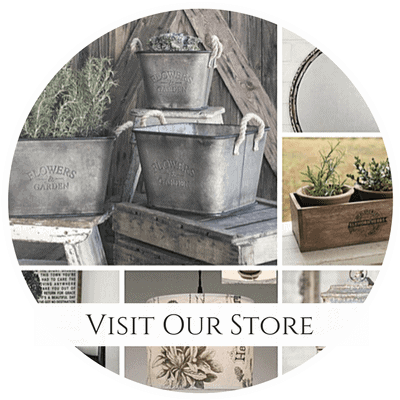 If anyone knows the secret – feel free to comment below! Don’t use dustless chalk. The waxy substance will not erase easily. Season your wall using sidewalk chalk. Use a matte, black wall paint as a base to improve coverage. Wipe down with a damp cloth and re-season the wall to start fresh. 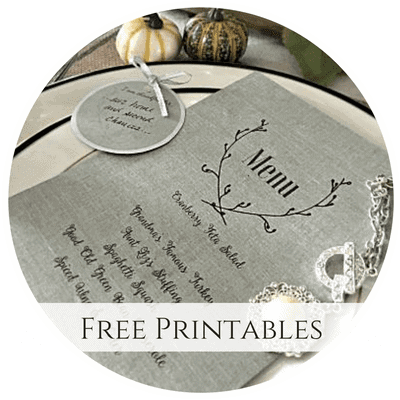 They are a BLAST to create things with your kids — so in my opinion, they are totally worth it, especially for creative spaces (craft rooms, kids rooms…and chalkboard in the kitchen totally makes sense). What do you think? 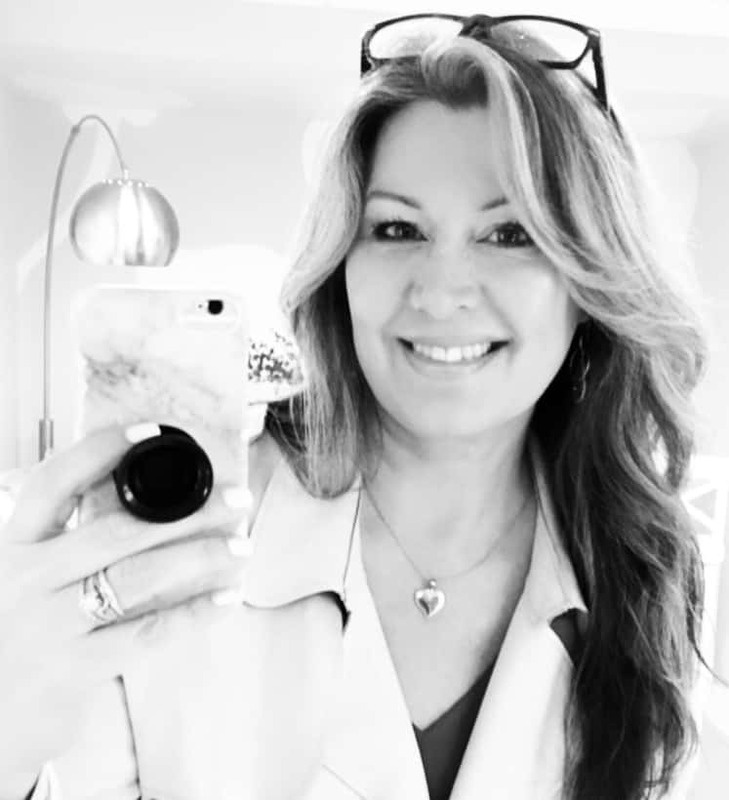 Do you hang onto trends, even though they are passe? What trend won’t you give up easily? 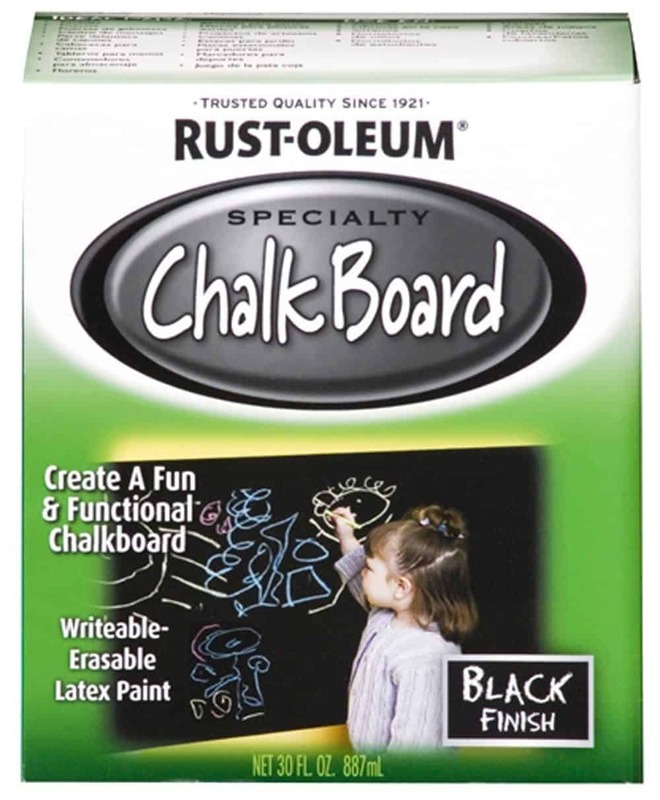 I still love chalkboard paint. 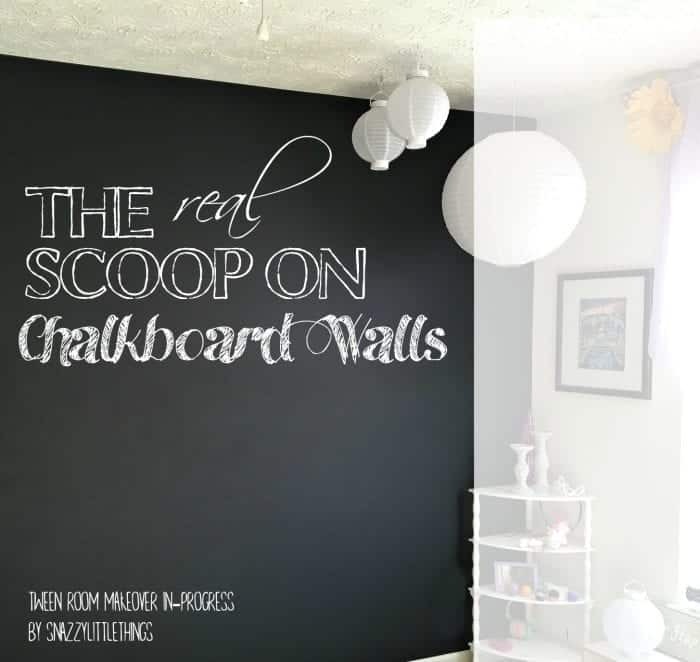 Wanted to pass on a Pinterest hint for cleaning up a chalkboard wall when it’s been washed numerous time and looks really messy, coke. It said to dip a rag in coke and wash down the entire wall. Not suppose to leave any sticky residue. I haven’t tried it yet but would certainly give it a try.